Derby County announce 2019/2020 season ticket plans. Derby County have today revealed their season ticket information for the 2019/20 season. 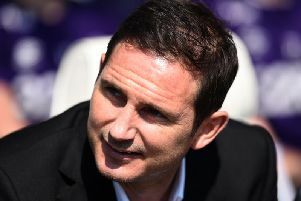 Frank Lampard’s side find themselves competing at the top end of the Sky Bet Championship table in the second half of the season, as they seek to secure promotion to the Premier League, and the final months of the campaign are certain to be exciting for all Rams fans. While the football staff have their focus firmly set on the coming months, work behind-the-scenes has been ongoing for next season at Pride Park Stadium. Season Tickets, which will officially go on sale from 9am on Friday (25th), continue to provide the best value for Rams supporters to watch their team in action at Pride Park Stadium. Season Ticket holders for the 2018/19 season will receive their Season Ticket guidance in the coming days, which includes detailed information about how to secure their seat for next season via their preferred communication option. The first period of sales for renewals and new Season Ticket purchases will run from 9am on Friday through to 4pm on Sunday, March 31 and offers the opportunity for fans to secure their seat at the cheapest possible price for next season. Season Ticket holders for the 2018/19 campaign will have their current seats reserved until 4pm on March 31. After this time any seats that aren’t renewed will be released for general sale. Relocation Week, which has proven popular with supporters in recent years and gives supporters the opportunity to choose an alternative seat at Pride Park Stadium, will take place between 3rd-7th April, while the second sales period will begin on Monday, April 8 and tickets, at that stage, will be subject to a price increase. Purchasing a Season Ticket at the earliest opportunity works out as the cheapest way to watch the Rams in action at Pride Park Stadium next season – regardless of what division they will be in! The Rams continue to offer FREE 2-12 Year Old Season Tickets as the club maintains its commitment to build its fanbase for the future. All 2-12s must be accompanied and sat with a full paying adult at a ratio of one adult to one child (aged 2-12) and be a Rams Squad Member. Derby launched their ‘Golden Rams’ initiative for this season, where supporters aged 85 and above who have been full Season Ticket holders for five consecutive years or more qualify for a free Season Ticket. Derby will once again continue this commitment for next season and the Golden Rams’ monthly events will continue to be arranged by the club. Season Ticket prices, which have been frozen in recent seasons, are subject to a small price increase for 2019/20. For adults renewing their multi-year Season Ticket, the price increase works out at £1 per game across the campaign and multi-year Season Ticket holders are subject to the lowest price increase as a result of their year-on-year commitment. Category E average costs per game, for adults, works out at £14.87 while the same in Category AA seats areas comes in at £28.91. These prices refer to the Multiple Year Renewal scheme to reward long-standing supporters. As an added bonus, there’s a special prize in place for the first 11 supporters to purchase their 2019/20 Season Ticket as they’ll be eligible to enjoy a VIP experience at an upcoming Derby County home fixture as part of the Rams’ ‘Starting XI’. On top of that, supporters will lead out the ‘Starting XI’ team on to the pitch at half time. The first supporter to purchase their seat for next season will have the opportunity to lead out the team at half-time at the same game and wear the captain’s armband.